During grilling season — which actually never stops in the Crappy household — we revere a different Holy Trinity: olive oil, kosher salt and ground black pepper. I’ve used this application a couple of times in the last week — on the steaks you see here, and on grilled corn we made to go with our burgers tonight. It’s pretty simple: brush with the oil, and apply the salt and pepper to taste. My taste? Lots of both. A word about the corn: I think most people grill it in the husks or wrapped in foil, and that works well. But try stripping all the husks away and just placing the cobs right on the grill. You have to watch pretty closely so they don’t burn, but they caramelize over the flames — it makes not so good spring corn tastes a lot better, and it makes good corn taste out of this world. There’s one other thing I want to try with the trinity — tuna steaks. And since this is Food Month, I think we’ll give it a shot here pretty soon. I’ll let you know how it goes. you’re killin’ me…..on day 17 of fire camp food. Oh, the horror…the horror. …and my grille misses me…..
I’ve been adventurous with meat the last few years. 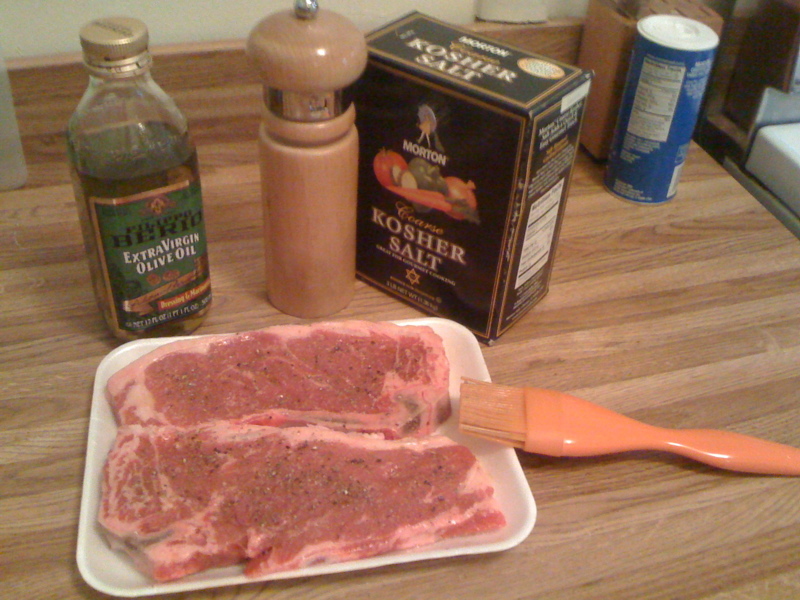 2 things to give a shot is (pending on the cut) is have it marinate in Italian dressing for a few hours or over night. The other is marinating it with Soyaki. It’s available at trader joe’s and is great if you want an oriental taste. I might have mentioned it on my blog once. I’m one of the foil guys for corn but when i wrap it I add a hearty dose of butter so it melts in while cooking. If I’m not doing that I use your way for some rockin corn. DM: If Fire Camp Food is the same speed as Army Food, I feel for you. Soy sauce and lemon pepper is another favorite of mine for steaks. And some minced garlic helps as well. I assume the Soyaki would be a little sweeter than plain soy sauce? Sounds like it would be worth a try. To the tuna steaks, try a couple dashes of sesame seeds to each side, on top of the oil, salt and pepper. It adds a nice little crust. Previous PostPrevious 11. bigger surprise.